Learn about what makes Peoria manufactured home roofs unique! Manufactured homes are growing in popularity thanks to their affordable pricing and their relative versatility. You can find a manufactured home with almost any feature that you would find in a traditionally built home, but you can relocate a manufactured home more easily to settle down on any lot you like. Because of the way they are designed, manufactured homes can experience unique roofing issues. They don’t experience more problems than traditionally built homes, but they do require the expertise of a qualified Peoria roofing contractor who understands their unique needs. Otherwise, you’ll be looking at costly roof repair down the line. Sky lights are a popular feature on manufactured homes. They make the rooms feel more open and the ceilings appear taller. However, sky lights are also a common source of leaks in the roof. Improper installation by an inexperienced roofing contractor can cause water to leak into the home around the sides of the sky light or can allow water to leak under the roof tiles or shingles, causing them to come loose. Skilled installation is required so that the edges of the sky light are thoroughly sealed. This usually involves placing down-lapping between the roofing material and sealing it with caulk, but other methods may also be used. Manufactured homes typically do not have a large attic space, so ventilation can be overlooked or botched. Yet without proper ventilation, heat will build up in that space and cause the roof shingles to crack and curl up, pulling away from the house. Without proper ventilation, heat and moisture can also rise into the attic space, condense and leak back into the house. Some water may only appear as small stains in the ceiling, but if the problem is large enough, water damage can spread through the home, causing rot and the spread of mold. Leaking is a common problem for any roof. If your roof was not properly installed by a qualified roofing contractor, it can experience a number of different problems that cause leaking. For example, the underlayment could begin cracking under the extreme heat of the Arizona summers, allowing moisture to penetrate. Asphalt shingles can also crack and curl in the heat, creating openings for water to enter the home. Improperly installed flashing, the wrong choice of roofing materials and improper gutter installation and maintenance can all lead to water damage on your roof, in your attic, or in your walls and ceiling. The only way to ensure a healthy roof is to work with a highly qualified and experienced roofing contractor. 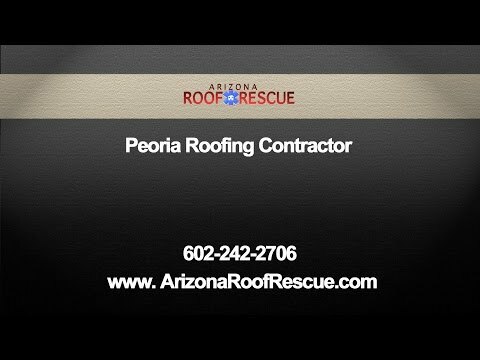 Arizona Roof Rescue offers a full menu of roofing services, from installing new roofs to performing roof repair. We work on all types of homes, including manufactured homes. Call us today to talk with one of our professional contractors about your roofing needs.